H.O.P.E. for the Alzheimer’s Journey provides advice, tools, and suggestions that the author and her brothers learned or developed during their 11-year journey providing care for their mother. The concepts are conveyed in an open, honest, and creative manner using original family email communications. These emails provide insight into the siblings’ thoughts, concerns, emotions, and deliberations as they realized their mother’s memory loss, sought a diagnosis and treatment, selected housing options, and developed care strategies as their mother continued to deteriorate from Alzheimer’s. The Caregiving Principle™, a novel approach to caregiving developed by the author, is the central theme. It is a framework to provide a deeper understanding of the person with Alzheimer’s and the role of the caregiver. 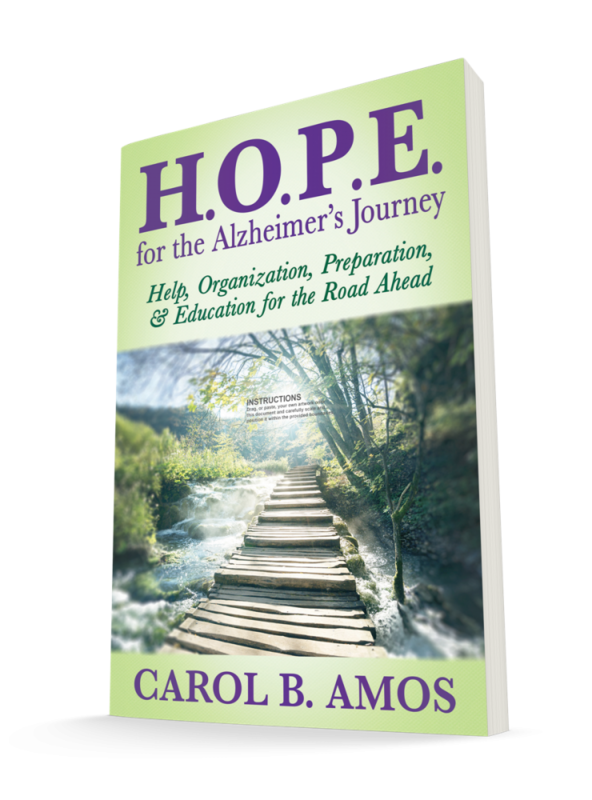 The book can make the Alzheimer’s journey less stressful and more rewarding. Hope in the title is used as an acronym but also refers to the hope that God gives us everyday. I share many of the rays of hope God gave me during this journey and share my top tool for caregivers, FAITH. Help – Caregivers are shown how to develop a circle of support that includes family, friends, professional caregivers, etc. Valuable resources are also included. Organization is critical for the busy life of caregivers. An entire chapter is devoted to organization. Education – Caregivers are provided with a wealth of information on diagnosis, communication, residential facilities, and caregiving. H.O.P.E. for the Alzheimer’s Journey equips Alzheimer’s caregivers with knowledge, tools, and advice for their difficult road ahead. The concepts are conveyed in an open, honest, and creative manner using original family email communications from Carol B. Amos’s own journey. Carol also introduces The Caregiving Principle™: a simple approach that provides a deeper understanding of a person with Alzheimer’s disease and a framework for the caregiver’s role. She provides examples of how The Caregiving Principle™ helped her connect with her mother. H.O.P.E. for the Alzheimer’s Journey encourages caregivers to take care of themselves and provides inspiration for a less stressful, more rewarding journey.